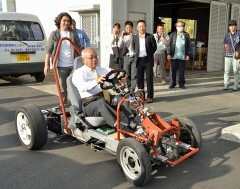 On February 1, Mayor Toshihiko Shimoji test drives the prototype EV at the Ecopit at Hirara in Miyako-jima. On February 1, at the Ecopit garage in Hirara on Miyako-jima, the local municipal office displayed a prototype small electric vehicle (EV) that they have produced in conjunction with local companies. The municipal office is conducting proving trials in order to explore the potential for the production and commercialization small EVs. Many people, including Mayor Toshihiko Shimoji, had a test drive in the car and confirmed it as providing a comfortable ride. The Municipal Small EV Production Association aims to produce an original vehicle in fiscal 2014. This is being carried out as a part of its Smart Energy Island Infrastructure Construction Project, which will run over the three years from fiscal 2012 to 2014. The prototype is a one-seater vehicle, the frame of which has already been assembled. This small EV was produced by the group, which includes the Okinawa Mold Technology Institute, in Uruma in 2011. The body design of the prototype will be determined at the second meeting of the association for the EV, which will be held in February. Except for the motor and the battery, the prototype is made using materials from the prefecture. Manufacturing Network Okinawa, which has experience in producing EVs, has done most of the assembly work, but in order to build up know-how local automobile maintenance companies will disassemble and re-assembling the prototype car.